Objectives For skeletal reconstruction in surgery for bone tumors, pasteurization of the bone has been used with favorable results over other methods of recycling. 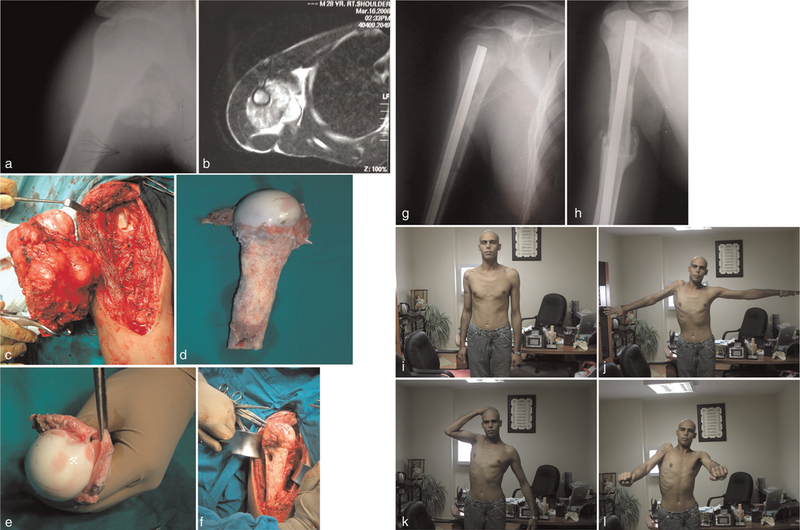 Patients and methods Ten patients with osteosarcoma of the proximal humerus were treated by wide margin resection and reconstruction with pasteurized osteo-articular autologous bone graft. They were seven females and three males, between 9 and 30 years of age who were followed up for at least 3 years (mean, 48 months). 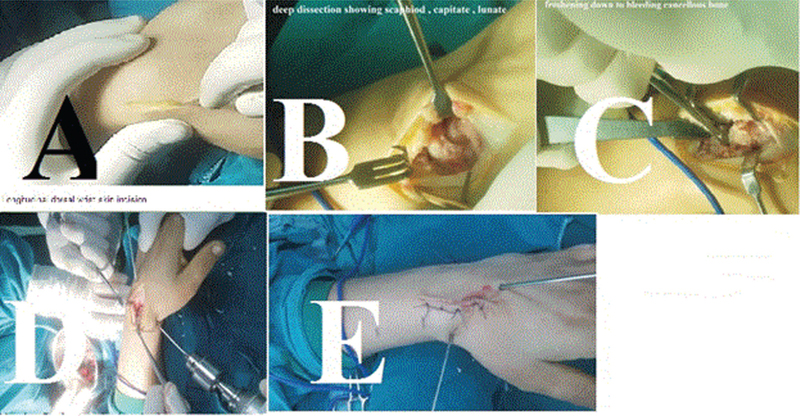 The International Society of Limb Salvage graft evaluation method was used for the evaluation of the radiographs. 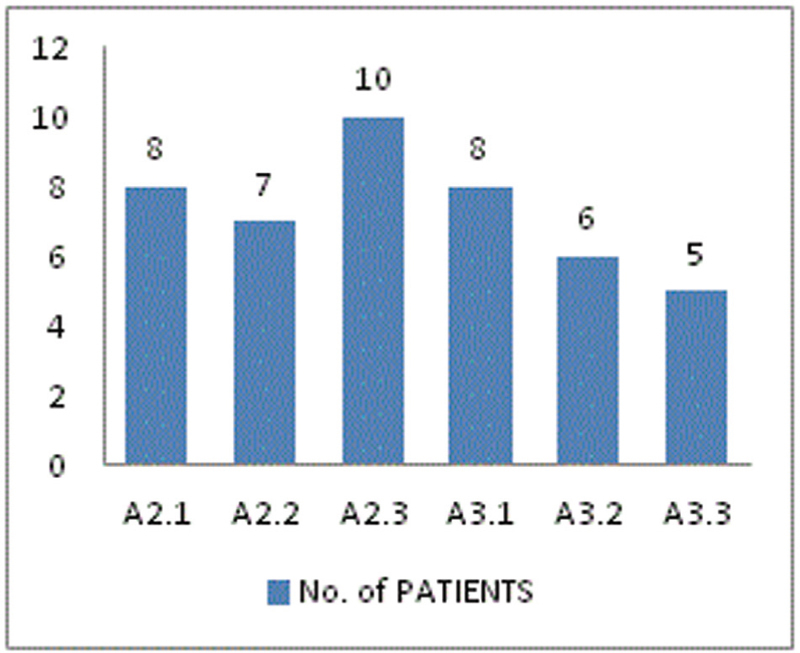 Results Six (60%) patients had complete incorporation of the graft and three (30%) patients had partial incorporation. The mean radiographic scoring rate was 84%. Viability of the grafts was evaluated by bone scintigraphy. Of the nine patients evaluated, uptake was detected in seven patients from ∼6 months postoperatively after which it increased gradually. The functional results were assessed by the system of the Musculoskeletal Tumor Society and the mean functional rating was 90%. Seven patients have been disease free and three have died of the disease. 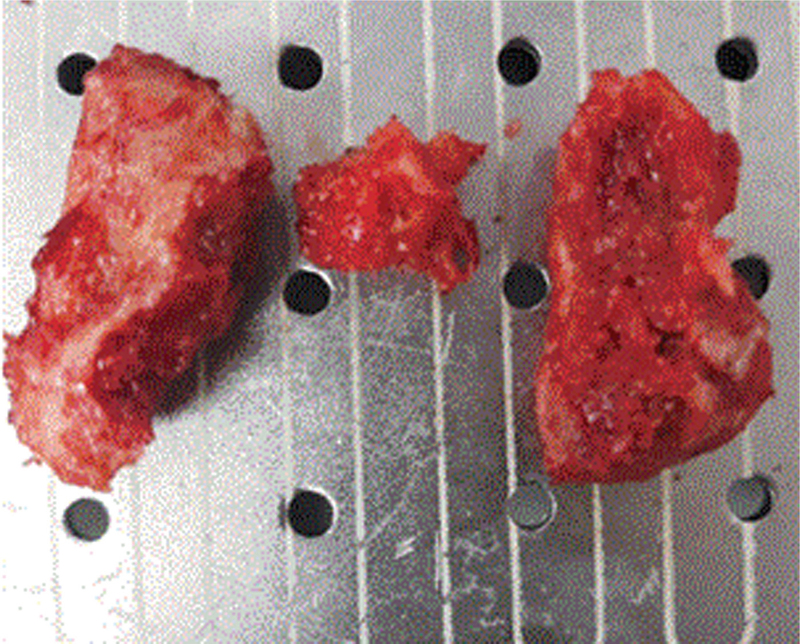 Resorption of the graft was seen in a single, 9-year-old patient (10%); no fractures or infections were seen. No local recurrence was detected. Conclusion These results indicate that pasteurization of the bone may be a useful option for reconstruction after resection of osteosarcoma of the proximal humerus. The advantages of extracorporeal pasteurization include convenience of use, avoidance of intraspecies infection and allogenic reactions, and satisfactory bone remodeling. Background Distal radius fractures following high-energy trauma are common injuries, usually associated with metaphysio-diaphyseal comminution with marked soft tissue injury making effective treatment a real challenge with high risk of complications. Minimally invasive percutaneous plate osteosynthesis (MIPPO) is a fixation technique giving priority for soft tissues and vascularity of the bone fragments achieving a relatively stable fracture construct while preserving a biological environment insuring rapid bone healing. This study aims to evaluate the outcomes of the MIPPO technique for the treatment of distal radius fractures with metaphysio-diaphyseal comminution. Patients and methods This prospective, case series study comprised 11 cases of closed distal radial fractures with varying degrees of displacement and metaphysio-diaphyseal comminution following high-energy trauma. All fractures were treated by the MIPPO technique through two volar longitudinal incisions using a volar locking plate bridging the comminuted segment. The patients were followed up clinically and radiologically and the functional outcome was evaluated according to the Dienst wrist scoring system. Results All fractures united with a mean union time of 12.5±1.6 weeks (range, 11–16 weeks) with no reported loss of fixation with secondary displacement, implant failure, or deep wound infection. No cases needed any secondary surgical intervention to achieve union. The follow-up period extended for a mean duration of 16.7±3.2 months with satisfactory (excellent and good) clinical and radiological results compared with the other side achieved in all cases. The radiological results (radial inclination, radial height, and volar tilt) were excellent in eight cases and were good in three cases, but the clinical results (range of motion of the wrist and grip strength) were excellent in all the 11 studied cases. Conclusion The results are very satisfactory. MIPPO minimizes soft tissue compromise with preservation of vascularity of the comminuted fracture fragments, thus improving the healing rate, shortening the time for union with no need for initial or delayed bone grafting for such comminuted fractures with few potential complications. Introduction Intertrochanteric femoral fracture is extracapsular fracture of the proximal femur between the greater and lesser trochanters. They represent about 50% of all hip fractures. Considerable complications such as pulmonary embolism, deep venous thrombosis, and pneumonia are frequently seen with these fractures mainly due to prolonged immobilization and specifically in elderly patients. 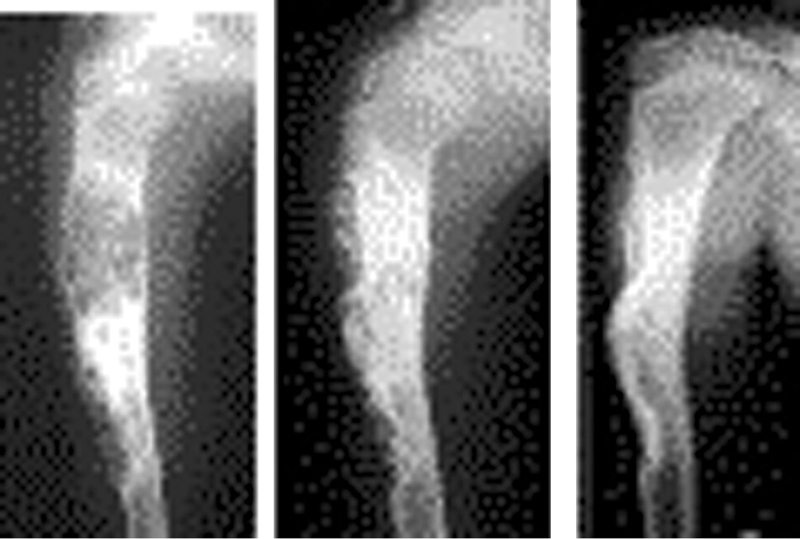 These fractures can be categorized into stable and unstable according to the bony construct displacement after a fracture. Approximately 35–40% will be classified as unstable three-part and four-part fractures; unstable fractures are difficult to manage with dynamic hip screw alone and are technically much more challenging and the treatment is more controversial. 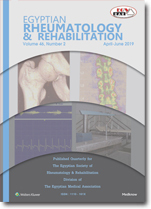 Patients and methods During the period from 1 July 2016 till 1 February 2017, 44 patients with unstable trochanteric fractures AO A2 and A3 who were admitted in the Causality Department in Kasralainy Hospital, Cairo University were randomly selected in our study to be treated by fixation with proximal femoral locking compression plate according to the standardized protocol. Results Patient demographics: 28 women and 16 men were included with a mean age of 61.75 years (SD 8.7); eight patients were diabetic; four patients were hypertensive, and three were cardiac. The total hospital stay was a mean of 8.95 days, mean preoperative period was 4.44 days, and the mean postoperative period was a mean of 4.73 days (SD 1.16).The mean operative time was 106 min; the mean blood loss intraoperative was 308 ml; postoperative infection was three (6.8%) cases; and all of them resolved with a single session of debridement. One case of deep venous thrombosis (DVT) was treated by conservative measures and four cases of varus malunion with no functional deficit. The mean time for fracture union was 17.9 weeks and the mean time till weight-bearing was 12 weeks. Mean harris hip score (HHS) at 6 months was 62.3 which is fair and 81.2 at 12 months which is good. Conclusion Proximal femoral locking compression plate was an effective treatment for unstable trochanteric fracture in terms of time to full weight-bearing. It can be used in these fractures with good functional outcomes and low complication rates. Level of Evidence: Level II randomized, prospective trial. Objective To evaluate the clinical outcome and advantages of percutaneous plate fixation for complex distal tibial fractures using locking compression plate-distal tibial plate (LCP-DTP). Design This is a prospective case series study. Setting Urban, level I trauma center. Patients and methods Twenty-seven adult patients, who met the inclusion criteria, with closed traumatic distal tibia with or without fibular fractures were treated using the minimally invasive plate osteosynthesis technique with LCP-DTP. 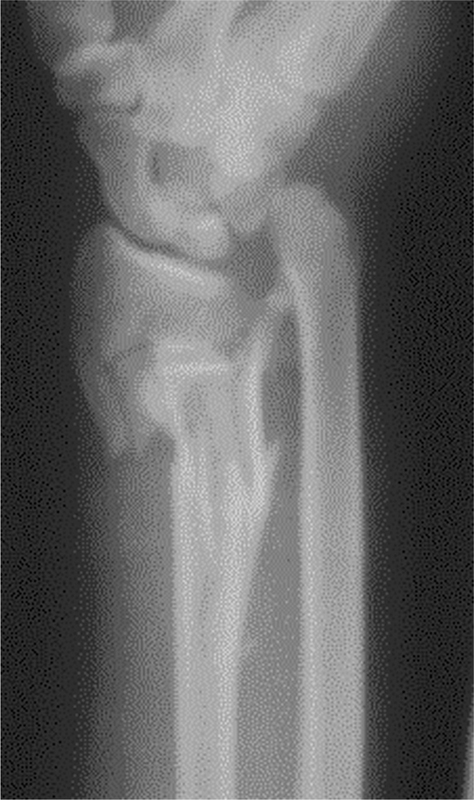 According to the AO fracture classification, there were 12 AO 43A fractures and 15 AO 43B fractures. The fibula was fractured in 15 patients and it was fixed in all of them. Main outcome measurements Perioperative complications following percutaneous fixation of the distal tibia such as infection, deformity, leg length discrepancy, ankle joint function, bony union, and metal failure within 1 year after the surgery. Results This study included 27 adult patients with traumatic fracture distal third tibia, 21 of them were men and six were were women. They were followed up for a period ranging from 14 to 19 months with an average of 16. None of the patients developed early perioperative complications. Deep venous thrombosis occurred in three patients, who were treated medically, residual loss of a few degrees of ankle motion in six and late infection related to the proximal screws was also observed in three obese uncontrolled diabetic patients. Union was achieved in all of them within 12–20 weeks with an average of 16. Conclusion Minimally invasive plate osteosynthesis for the distal tibia using the LCP-DTP is safe and effective in the treatment of complex distal tibial fractures. Background Subtalar arthroereisis has been described as a minimally invasive, effective, and low-risk procedure for the treatment of flatfoot in children. Purpose To test the effectiveness of subtalar extra-articular screw arthroereisis procedure as a corrective measure for flexible flatfoot (FFF) in children. Patients and methods From 2012 till 2014, 12 feet of eight children with FFF were treated with subtalar extra-articular screw arthroereisis at Banha University and Banha Insurance Hospitals. With a mean age of 10.5 years and ranges between 5 and 16, five male and three female patients were selected and were required to follow-up every 18 months (range, 15–27 months). Results This technique offered worthy results to correct idiopathic flatfoot in children, due to its less invasive and less damaging nature for the structures of the sinus tarsi. 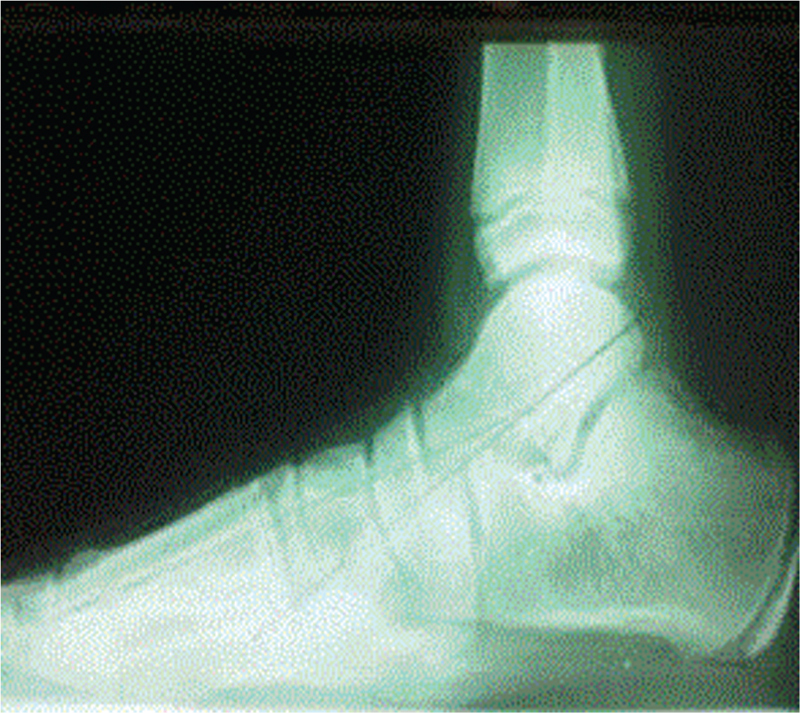 On the basis of clinical inspections and radiographic measurements, there was clear improvement of foot function. Conclusion Subtalar arthroereisis is an effective procedure for FFF correction as it is simple and can be performed rapidly. Additionally, the screws mechanical and proprioceptive effect result in notable correction of the deformity. Background The Ilizarov technique has been used in Egypt for the past 20 years in the management of nonunion of long bones. This method uses fine wires and pins inserted percutaneously, which are attached to provide a strong frame construct. Most tibial and femoral nonunions can be treated successfully by internal fixation. However, proximal tibial nonunion can prove a difficult problem. The Ilizarov method can prove useful for treating these complex injuries. 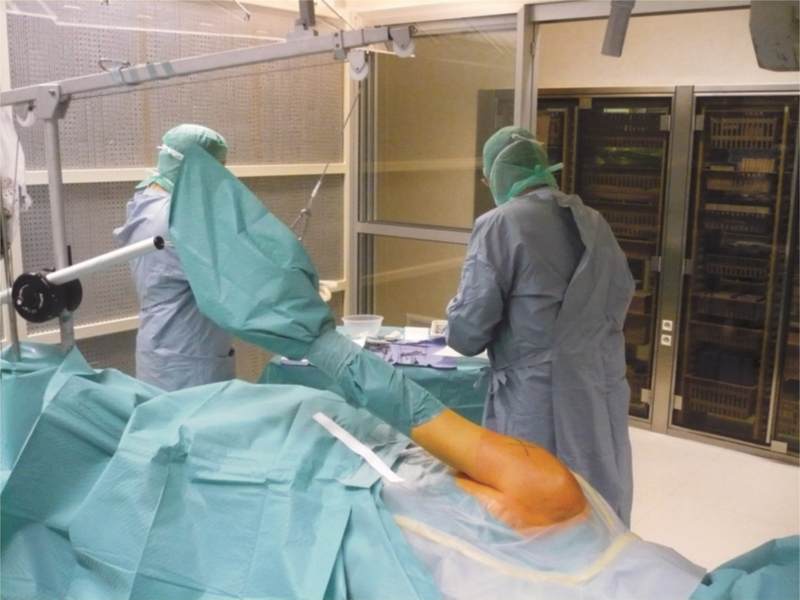 Objective The aim was to evaluate and analyze the clinical and radiological outcomes of Ilizarov external fixation in treatment of proximal tibial nonunion prospectively while focusing on its effectiveness, advantages and complication. Patients and methods A total of 16 patients (11 male and five female; average age: 33.5 years) who had post-traumatic extra-articular proximal tibial nonunion between April 2010 and October 2011 treated with the Ilizarov technique were included. Intervention method was Ilizarov technique, and main outcome measures include functional and radiological outcomes assessed using the Association for the Study and Application of Methods of Ilizarov criteria. Results All 16 patients showed union. None required amputation. According to the Association for the Study and Application of Methods of Ilizarov score regarding bone/radiological results, eleven were classed as excellent, four were good and one patient was fair. Functionally 10 patients were graded as excellent, five as good and one as fair. Conclusion The Ilizarov method is a reliable tool allowing early definitive treatment with a low complication rate and a good clinical outcome in treatment of patients with proximal tibial nonunion. Background Shoulder impingement syndrome and acromioclavicular joint (ACJ) osteoarthritis often occur simultaneously and are easily missed. Arthroscopic resection of the distal clavicle and subacromial decompression (SAD) can avoid complications arising from the open method. Patients and methods In this prospective study, arthroscopic SAD as well as ACJ resection was done in 15 patients with subacromial impingement syndrome and ACJ arthritis, who were treated between March 2009 and April 2013 at Minia University Hospital after failure of a minimum of 6 months of conservative treatment. The patients were followed up for 12 months. Results University of California at Los Angeles score is recorded preoperatively and at final follow-up 12 months after arthroscopic SAD concomitant with arthroscopic ACJ resection. The patients’ total University of California at Los Angeles score was significantly improved postoperatively (P<0.01) in relation to the preoperative one. Conclusion Arthroscopic SAD and ACJ resection gives best results in patients who failed conservative treatment and had persistent symptoms, and it helps in detection of any intra-articular pathology such as biceps tendon degeneration. Objectives To evaluate the clinical and radiological outcome of Kienbӧck’s disease treatment by scaphocapitate fusion in 20 patients. Background Kienböck’s disease remains a difficult entity to treat till understanding the etiology and natural history of the disease. Treatment will continue to be based on trails to decrease load across the lunate or revascularizing it. Patients and methods This study was retrospectively performed on 20 patients, with age of 19–59 years. All of the patients presented with Kienböck disease grades II and IIIa and with no evidence of arthritis. They were treated with scaphocapitate arthrodesis using the dorsal approach. The mean follow-up period was 6 months. Complications and adverse events were recorded. 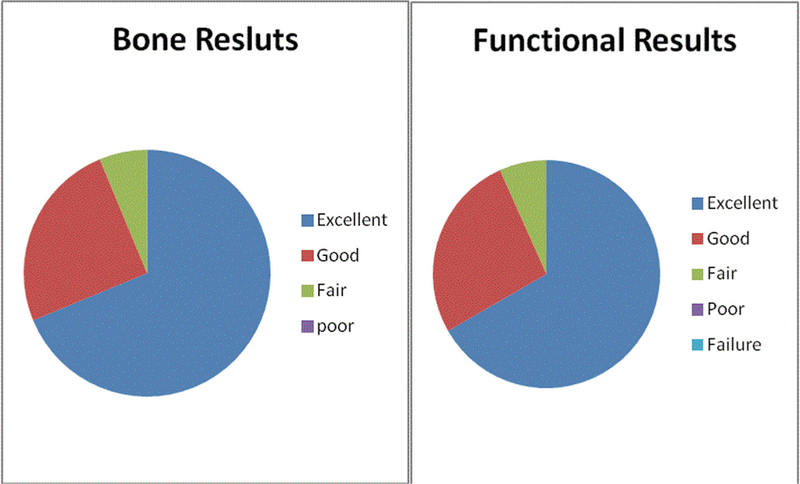 Results The clinical results were classified on subjective base and were graded as excellent outcome in six (30%) patients, good in 10 (50%) patients, and fair in 4 (20%) patients. Conclusion Scaphocapitate arthrodesis is a good procedure that mechanically decompresses the lunate and prevents progressive carpal instability with minimal complications. 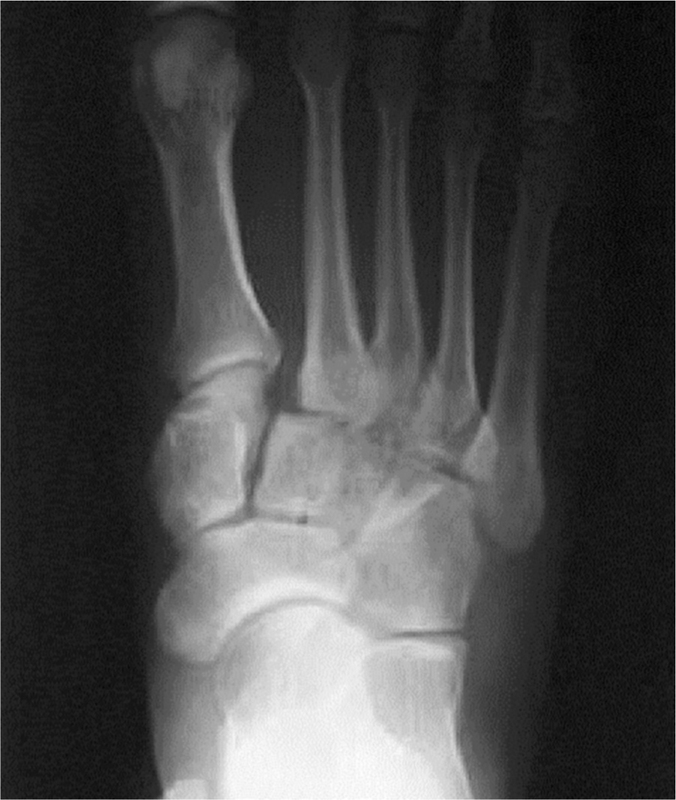 Background Lisfranc fracture dislocation is a devastating trauma affecting usually young active age group, with a high rate of missing or misdiagnosis, resulting in prolonged recovery and significant long-term morbidity. Objective This study describes the indications, contraindications, technique, and results of treating severe Lisfranc fracture dislocation by primary arthrodesis. Patients and methods A prospective study was conducted on 10 patients with closed Lisfranc fracture dislocation, who had been treated at Benha University Hospital and Benha Insurance Hospital between January 2010 and March 2013. Mechanism of injury was high-velocity injury in five patients, fall from a height in four patients, and a hyperplanterflexion foot trauma during descending stairs in one patient. Mean age at time of surgery was 27.7 years (range, 19–38 years). All patients were followed up with a follow-up period of 21.3 months (range, 6–36 months). Results According to the American Orthopedic Foot and Ankle Society scale, the clinical outcome was 81.7 (range, 79–84). Complications met in this study were as follows: three patients had a postoperative Sudeck’s atrophy, one patient developed superficial wound problem, and two patients had forefoot stiffness and difficulties in shoe wearing. Conclusion Open reduction and internal fixation of severe Lisfranc fracture dislocation with screws and primary arthrodesis is the treatment of choice, as these fracture dislocations are known for their affinity for post-traumatic arthritis and subsequent need for a second operation. The level of evidence for this article was case series type IV. Background Dynamic supination is a common sequelae following successful nonoperative treatment of clubfoot with the Ponseti technique. It is resulted from a strong tibialis anterior muscle and weak antagonists, particularly the peroneal and tibialis posterior muscles. Tendon-balancing procedure is the most reasonable solution. Use of tibialis anterior tendon transfer (TATT) in recurrent clubfoot deformities has been described since 1940. Patients and methods Through this study, we compare the results of split versus full TATT in the treatment of residual dynamic supination in treated idiopathic clubfoot by Ponseti method. Patients were divided into two groups. The first group (nine patients with 10 feet) (group I) consists of the patients who were managed with split tendon transfer and the second group (nine patients with 10 feet) (group II) consists of the patients who managed with full tendon transfer. Garceau and Palmer’s clinical criteria and a grading system proposed by Thompson and colleagues were used for evaluation of the results of tendon transfer either split or full. Results A total of 18 children (13 males and five females) were involved in this study. The average of the age of the children in group I was 4.3 years and in group II was 4 years at the time of surgery. According to Garceau and Palmer’s clinical criteria, in group I, the preoperative ratings of 10 feet were as follows: four feet were good and six feet were fair, with scores of 3 points and 2 points, respectively. The postoperative ratings were five feet were excellent and five feet were good, with scores of 4 points and 3 points, respectively, with a statistically significant improvement (P<0.05). In group II, the preoperative ratings of 10 feet were six feet were good and four feet were fair, with scores of 3 points and 2 points, respectively. The postoperative ratings were six feet were excellent and four feet were good, with scores of 4 points and 3 points, respectively, with a statistically significant improvement (P<0.01). In comparing the results of both groups, no statistically significant relation could be found (P>0.05). According to the grading system proposed by Thompson and colleagues for restoration of muscle balance, in group I, eight feet achieved good results and two feet achieved fair results, whereas in group II, seven feet achieved good result and three feet achieved fair results. In comparing the results of both groups, we found there was no statistically significant relation (P>0.05). Conclusion TATT is an excellent method of correcting residual dynamic clubfoot deformity and there is no significant difference in the results by either full transfer or split transfer, and the surgeon’s preference plays a major role in selection of the procedure. Objective Congenital pseudoarthrosis of the tibia is still a mystery and a great challenge to pediatric orthopedic surgeon. Owing to the different morphology of congenital pseudoarthrosis of the tibia, there are many treatment options with many debatable points. The fibula is a main strut that protects the tibial union and has implications on the orientation of the ankle. 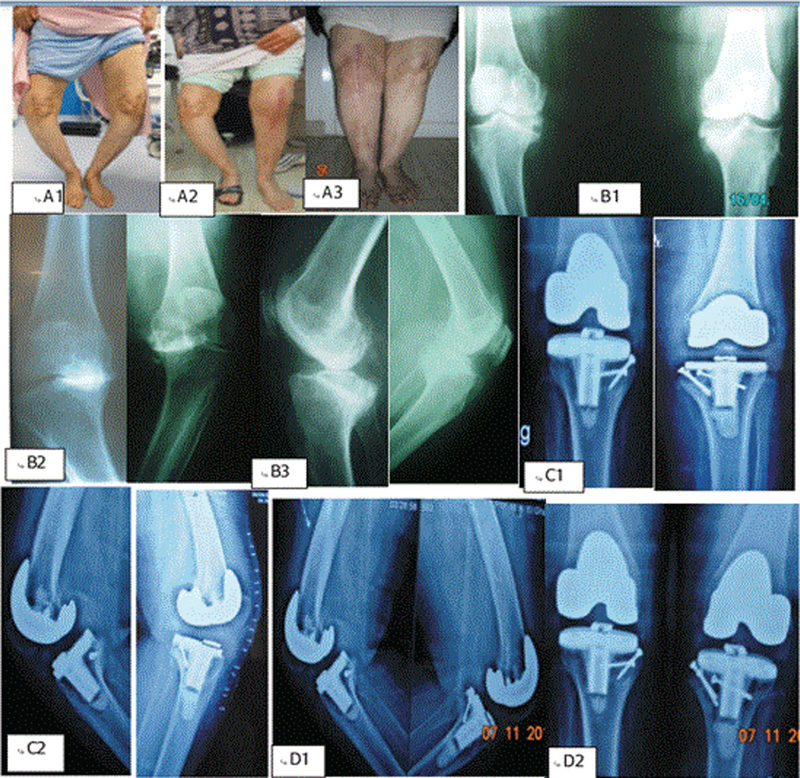 Patients and methods Nine patients had congenital pesudoarthrosis of the tibia, and their average age at the time of operation was 3.8 years; four of these nine patients had intact fibula (group 1), whereas five had associated pseudoarthrosis of the fibula (group 2). The treatment method was decided depending on the condition of the fibula, whether it was intact or affected by pseudoarthrosis. 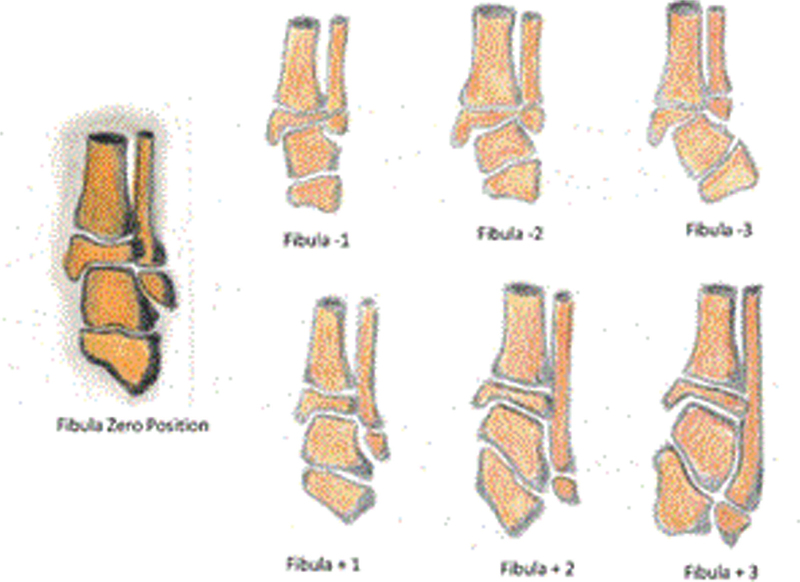 In cases with intact fibula, tibiofibular fusion was done. However, in cases with associated fibular pseudoarthrosis, the pathologic pseudoarthrotic tissues were resected and the tibia and fibula were fixed with intramedullary wires and Ilizarov ring fixator. Results A union rate of 100% was achieved without a refracture till the last follow-up. Good tibial alignment was achieved in all cases, and wide cross-sectional area at the pseudoarthrosis site was obtained in all cases. 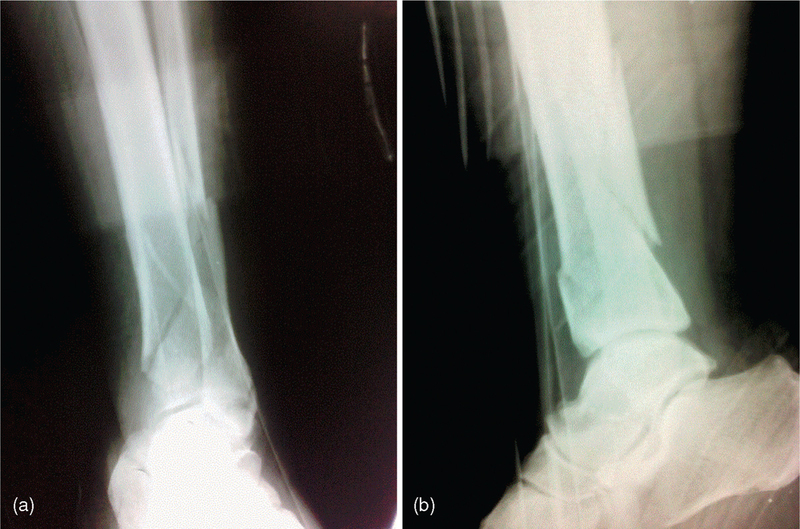 One case with fibula plus +1 position was complicated with a varus deformity of the ankle. Conclusion Addressing the fibular problem safeguards against refracture and protects against ankle joint deformity. Achieving tibial union with wide regenerate or wide fusion mass, good tibial alignment and fibular union is mandatory for preventing refracture. The article was level of evidence IV. Introduction Low-grade spondylolisthesis often presents with low back pain and radicular symptoms and often requires surgical intervention in the form of decompression and instrumented fusion. Objective The aim of this study was to evaluate the safety and efficacy of transforaminal lumbar interbody fusion using autologous laminar strut grafts in low-grade isthmic spondylolisthesis. Patients and methods A total of 15 patients in a prospective cohort study have been clinically evaluated between January 2014 and August 2017 after performing transforaminal lumbar interbody fusion using autologous laminar strut grafts. Results Mean operative (OR) time was 156 min, and mean estimated blood loss was 377 ml. Three patients required packed red blood cells transfusion. The mean length of stay at the hospitals was 4 days. One patient had an accidental durotomy and one patient developed low-grade fever. One patient developed superficial infection. None of the patients developed any neurologic deficits. All patients showed evidence of fusion and bony bridging between the vertebral bodies within 6 months after the surgeries. Conclusion The technique of using laminar strut grafts in the treatment of patients with low-grade isthmic spondylolisthesis is safe and with low complications rate. Background Despite all established treatments, large bone cysts in children remain an unsolved problem. Bone grafts are often necessary to fill the defect, provide support, and enhance biological repair. Autogenous cancellous bone grafts usually from the iliac crest have been considered the gold standard. However, the limited quantity of a bone graft especially in children may limit its use. Calcium phosphate ceramics can be used to fill bone defects. These materials act as an osteoconductive bone-void filler that completely gets resorbed as newly formed bone remodels and restores anatomic features and structural properties. Aim of the work This study was carried out to assess the results of treatment of benign bone lesions in children using autologous bone graft either alone or in combination with hydroxyapatite (HA) granules. Patients and methods The study included 18 children having benign bone lesions. Their age ranged from 5 to 15 years (mean, 8.2±1.59 years). The resultant defect was filled with autogenous iliac crest graft in five (27.8%) patients in group I, and a combination of autogenous bone graft and G-bone HA granules in 13 (72.2%) patients in group II. The defect size ranged from 6 to 17 cm3 in group I (mean, 9.75±43.86 cm3), and from 11.5 to 115.5 cm3 in group II (mean, 43±33.92 cm3). The patients were followed up clinically and radiologically for a period that ranged from 12 to 56 months (mean, 17±11.41 months). Results The overall success rates were 80% for group I (four out of five) and 92.3% for group II (12 out of 13). Recurrence was met in one (20%) of five patients in group I, and one (7.7%) of 13 patients in group II. At the final follow-up, four of five patients in group I (80%) were considered Neer class I, and one (20%) patient was considered Neer class IV. Ten (77%) of 13 patients in group II were considered Neer class I, two (15.3%) patients were Neer class II, and one (7.7%) was Neer class IV. The differences in the results of both groups were statistically insignificant. Conclusion The use of HA synthetic granules with autogenous bone graft is a safe and effective option for the situations when a large amount of graft is needed especially in children with large and recurrent benign bone lesions. Background Fractures of the distal radius are common, especially in elderly patients. Treatment consists of closed reduction and immobilization. Long-term effects of malunion indicate surgery for potentially unstable fractures. Patients and methods A prospective study was conducted in 60 patients with a distal radius fracture between February 2012 and January 2013 and matched with criteria included in this study. The strategy of management was subdivided into plaster cast immobilization with subsequent rehabilitation, manipulation with subsequent cast immobilization, and surgery (volar plating). Outcomes were graded as good or poor based on the complications and the function achieved at the end of follow-up. Results A total of 60 patients were included in the study. Thirty five patients had less than or equal to 3 instability markers (group A) and 25 had more than or equal to 4 (group B). Overall, 42 were female and 18 were male. The average age was 58 years, with an age range of 20–65 years, in group A, whereas the average age was 57 years, with an age range of 21–63 years, in group B. Conclusion Presence of four or more instability markers is globally associated with a poorer outcome. Patients with four or more markers who underwent surgery did uniformly better than those with manipulation alone. In patients with three or fewer markers, nonoperative management achieved good outcomes. Aim of study The aim of the study is to compare the results of primary total knee arthroplasty with large bone defects treated with autologous bone grafts from resected bone cuts with a group of patients in whom knee arthroplasty was made without the need for bone grafting. Patients and methods In all, 256 knees of patients suffering from painful osteoarthritis and who were admitted to Mansoura University Hospital over a period between 2003 and 2007 were studied. Bone stock defects were treated in 79 knees by structural solid bone from resected bone cuts and were fixed by screws. The control group consists of 167 knees treated in the same period without the need for bone grafting and prostheses were implanted directly on the resected surfaces. All patients were assessed according to Knee Society Score (KSS) parameters. The radiographs were analyzed with special regard for: correctness of implant placement, presence of radiolucent zones both around implants and grafts, and bone grafts healing. Results Bone grafts were incorporated in 79 knees within an average of 5.6 months. There was no graft collapse or stress fractures, loosening, or nonunion. The minimum follow-up period was 10 years. The postoperative KSS of both groups (total knee replacement (TKR) with no grafting and TKR with grafting) improved markedly (P<0.0001) from the preoperative values, while the postoperative KSS did not differ significantly (P=0.51 and 0.66) between the two groups Conclusion The use of autologous bone grafting for bone stock reconstruction in primary TKA are comparable with the results of TKR without the need for bone grafting. Autogenic bone grafting for defects in TKR is justified as it is biological, naturally harvested, and is cost effective besides preserving bone stock for future revisions.